With absolutely nothing left to play for except finishing the 82-game schedule, Washington Capitals coach Barry Trotz scratched Alex Ovechkin, Nick Backstrom, John Carlson, Brooks Orpik and Jay Beagle, the last of whom nursing a sore knee after blocking a shot in Saturday night’s win over St. Louis. The NHL has postponed Friday’s game between the Capitals and Anaheim Ducks due to the blizzard that is beginning to impact the Washington metro area. A decision on the Sunday afternoon game against Pittsburgh will be announced Saturday morning. No makeup date has yet been determined for the Ducks game. Saturday’s game between the Wizards and Jazz had already been postponed as well. Ducks' support staff is removing equipment from their dressing room and taking it back to the loading dock. Game has been postponed. First Star: Alex Ovechkin. C’mon. Two goals, retaking league lead. Two assists, giving Andre Burakovsky some momentum to stay on the top line (and in the lineup, period). Ovechkin is carrying this team right now (wen has he not), yet gets very little mention as an MVP candidate. Does the nationals (Canadian) media have Ovi burnout? Sure. But they are sleeping on another incredible season. Hard to imagine this Caps team contending for playoffs without another stellar season from the Great 8. Second Star: Andre Burakovsky. Two pretty goals, courtesy of Mr. Ovechkin. Bura’s had some ups and downs this season, but obviously the talent is there. Barry Trotz has gotten some grief on the way he’s handled the young talent on the roster, but he’s not just looking at this year’s results (unlike the previous coach), but also looking forward like a coach that knows he has job security. It’s not how you start… Evgeny Kuznetsov’s game has progressed of late as well. Hopefully Trotz can figure out how to get Tom Wilson going again, because I envision a time in the not-so-distant future made up of the three. Third Star: Justin Peters. Justin Peters? Seriously? After I tweeted this in the first? This has got to stop. An NHL team cannot survive with one NHL caliber goalie. If they don’t want Gru on the bench, have to trade for one. Peters has been, frankly, miserable this season. But after the very rough first period, he settled down and made some quality saves in the second and especially in the third as Anaheim was scrambling to get back in it, with 30 saves in total, including 11 on the penalty kill. Credit begrudgingly where its due, but primarily because he’s set the bar so low for himself this year. The Anaheim Ducks tried to jump on the Washington Capitals early, but Alex Ovechkin had other plans. The captain kept the Caps in it early with two first period goals and tacked on two assists to lead the Caps to the 5-3 win in Anaheim. First Star: Evgeny Kuznetsov. The rookie is starting to come into his own and his line Friday night was a big past of the reason the Caps took two points against one of the better teams in the league, after falling behind. He assisted on both goals and his pass on the first was so good even Jason Chimera couldn’t screw it up…though he tried. Kuzy even had one of the two Caps tallies in the shootout to boot. Second Star: Philipp Grubauer. The netminder was called up in a very tough spot: recalled for a spot start in the back half of the back-to-back because the team no longer trusts Justin Peters to do so. 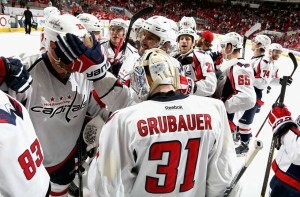 Grubauer came in and acquitted himself well, making 25 saves in the process. Both Anaheim goals were nothing-you-could-do-about types, with Ryan Kesler scoring on the power play and Corey Perry bouncing a ricochet off Gru’s skate. Third Star: Troy Brouwer. I have half a piece written on “Where’s Troy” but didn’t get to finish it before his two-goal outburst in his 500th game Wednesday night. All he did for an encore was supply the Caps with a remarkable from-his-knees, diving, keep-in at the blue line, which propelled the 2-on-0 for the first goal. On the second goal, he acted like a door in from of Iyla Bryzgalov, allowing John Carlson to sneak a shot through without the Bryz so much as getting a sniff at it. Guess I’ll save that piece I was working on for later. Evgeny Kuznetsov has struggled to find his niche in the lineup this season, but he seems to have found some chemistry with linemates Jason Chimera and Troy Brouwer. Their line accounted for both of the Washington Capitals’ regulation goals in their 3-2 shootout victory over the Anaheim Ducks. Kuznetzov earned two assists, Chimera scored a goal and collected an assist, and Brouwer had an assist, which came off a diving keep-in play at the blue line, which led to Chimera’s tying goal. Kuznetsov’s linemates had nothing but praise for the rookie during their postgame scrums. Chimera has faced his own adversity this season, too. He was a healthy scratch in Ottawa Friday night, so coming back with a strong, two-point performance against a top NHL team speaks volumes for his resiliency. Trotz took a chance with putting these three players together, as a coach does any time he composes a lineup, and his faith was rewarded handsomely. Kuznetzov’s two assists marked his third multi-point game this season. He has seven points in his last seven games, and points in three consecutive games. He has 22 points on the season. There’s still a long road to go down, but Tuesday night the Washington Capitals earned an important two points against a top Western Conference team on the road, escaping Anaheim with a 3-2 win as Jaroslav Halak continued his quality play since joining the team at the trade deadline, stopping 43 Ducks shots en route to victory. The win pulls the Caps even in points with Columbus for the eighth and final playoff spot in the East, though Columbus has the tiebreaker — and two games in hand. The Caps broke out quickly, as Joel Ward collected a rebound from Jason Chimera, eluded Jonas Hiller on at the right pipe and notched his 21st of the season just 2:11 in. Patrick Wey, inserted into the lineup for healthy scratch Connor Carrick, registered an assist with the original shot towards the goal. As has been the case all season, the Caps allowed the tying goal less than a minute later — 59 seconds, to be exact. Ben Lovejoy took a drop pass and blistered a shot that got through Jaroslav Halak, making his sixth consecutive start since being acquired at the trade deadline, as the Caps took a sloppy and ill-timed line change. Anaheim had the better of play throughout most of the first period, but veteran Saku Koivu took an uncharacteristically undisciplined with 31 seconds in the frame, allowing the Caps second-rated power play a chance before the end of the frame. Alex Ovechkin took a pass from John Carlson and quickly swung the puck through the slot to Nick Backstrom on the far side, switching the ice and getting the Ducks off-balance. Backstrom took the puck to the net, where Marcus Johansson first had a whack and the puck squirted through, where Troy Brouwer was able to tap it in with 10 seconds left to give the Caps a 2-1 lead at the first intermission. The Caps put their penalty kill to work in the second period. Just 2:05 in the Caps where whistled of too many men. After the faceoff, Troy Brouwer air-mailed one off the rink and went to the box for delay of game. The Caps, led by Halak (43 saves) proceeded to kill the 5-on-3, then killed off two more penalties in the period escaping the second with the 2-1 lead intact, though 1:29 left of Jay Beagle’s trip remained to carry over to the third. The Ducks weren’t able to capitalize on the remainder of Beagle’s penalty, but right after it expired, former Caps center Mathieu Perreault whipped a wrist shot through the screen of 6’3″, 250-pound Patrick Maroon and past a blinded Halak to tie the game at two just 1:32 into the final frame. The tie didn’t last long. Anaheim’s Matt Belesky was called for slashing John Carlson, and it took just eight second of the ensuing power play for Carlson to feed Alex Ovechkin in his wheelhouse in the left wing face off circle, and Ovechkin’s one-timer sailed past Hiller to put the Caps back up, 3-2. All that was left was for Washington to kill off yet another minor penalty, and Halak finished the job with several saves in the final sequence with the Ducks attacking with an extra skater with their goalie pulled. If the Caps manage to save their season and qualify for the playoffs, they can point back to this big win on the road against a very good Anaheim team as perhaps the motivating factor. The Caps continue that plight Thursday night in Los Angeles against the Kings at 10:30 pm ET. 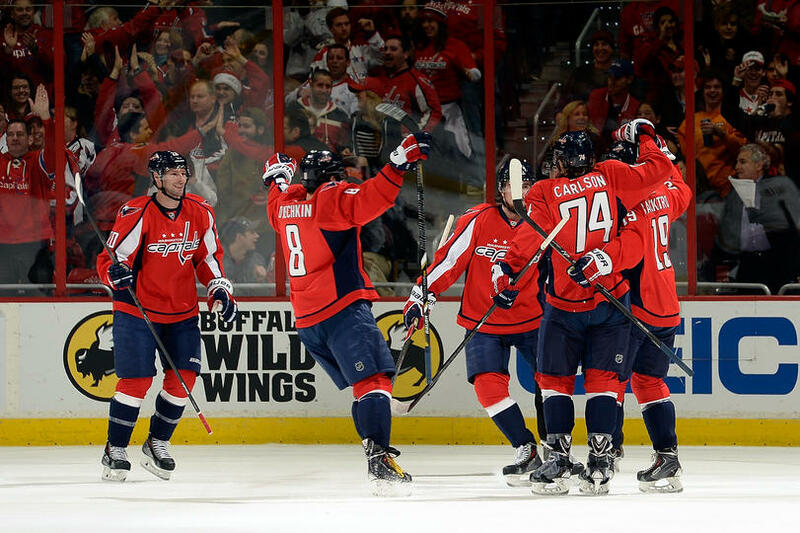 When the Washington Capitals and Anaheim Ducks last met, on November 2, 2011, it was a 5-4 overtime thriller that saw the Capitals chip away at a three-goal deficit and tie the game with seconds left in regulation. Nicklas Backstrom scored the equalizer and game winning goal. This time, the Capitals squandered a 2-0 lead and lost 3-2 in regulation to their former coach’s team. Bruce Boudreau hadn’t set foot in Verizon Center since being fired on Thanksgiving 2011, just a couple weeks after the last meeting between the Caps and the Ducks. The juxtaposition of coaching against his former team and players he helped develop during his tenure in Washington does not escape Boudreau. “When you win a championship, no matter where you are, you always have a special bond with that group. That’ll be with me forever,” Boudreau told reporters Monday morning at Verizon Center, referring to his Calder Cup championships with AHL Hershey, with many of the players now wearing Capitals sweaters. The Ducks entered Monday’s contest against the Capitals riding an eight-game win streak and extended it to nine with their win. “In the scheme of things, I’m more happy we kept the streak alive. 59 points after 39 games is a pretty cool feat for what we’ve gone through,” said Boudreau. Mikhail Grabovski and Nicklas Backstrom scored in the first period to give the Caps a 2-0 lead, but the Ducks scored three unanswered goals over the next two periods to win 3-2. The Capitals only had eight shots on goal during the second and third periods, for a total of 19, to the 29 the Ducks threw at Philipp Grubauer. Hampus Lindholm, the 19-year-old rookie defenseman who scored the Anaheim’s go-ahead goal, said the team has a positive approach to each game. “We just find a way to win instead of finding a way to lose,” said Lindholm. 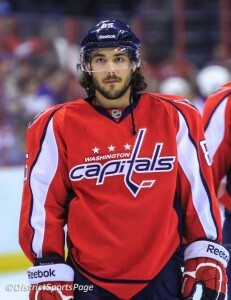 The Washington Capitals traded center Mathieu Perreault to the Anaheim Ducks in exchange for minor league forward John Mitchell and a fourth round pick in the 2014 entry draft. 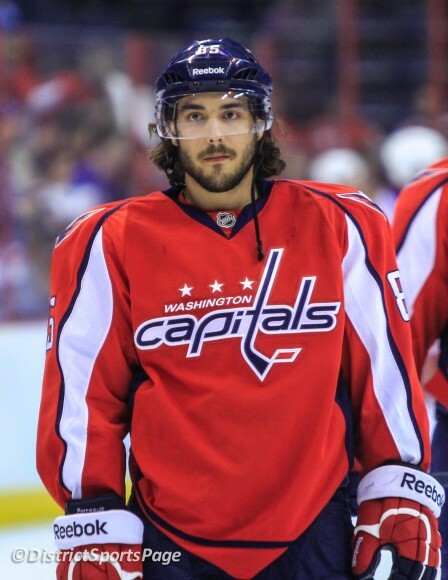 With Perreault’s $1 million salary cleared from the books, the team now has cap space to keep Tom Wilson on the big squad instead of sending him back to Juniors. There are a number of factors to consider when contemplating this deal. First, it removes a useful, legitimate NHL player — and a center to boot — off the Caps roster. Perreault had most likely maxed in his production and contribution at this level, but he’s still a legitimate bottom six forward. He has offensive skill, which (as we’ll discuss in just a bit) is at a premium on this team.